ROUND ROCK, Texas - Take a bow, Nick Tanielu! 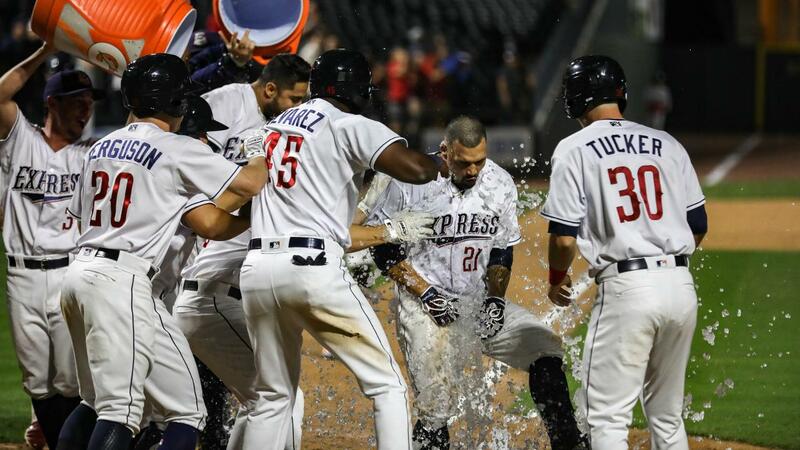 The Round Rock Express (4-3) knocked off the Nashville Sounds (2-5) by a final score of 9-5 after 3B Nick Tanielu blasted a walkoff grand slam that careened off the top of the Home Run Porch in deep left field in the bottom of the 10th inning on Wednesday night at Dell Diamond. Tanielu's slam gave Express RHP Brendan McCurry (1-0, 0.00) his first victory of the season. The righty reliever tossed 2.0 scoreless innings, allowing just one hit and a walk while striking out a pair. On the losing end, Nashville LHP Miguel Del Pozo (0-1, 7.71) surrendered five runs, only four of which were earned, on a total of three hits and four walks in 1.2 innings of relief. For the second night in a row, Nashville scored the game's first run as SS Danny Santana singled home C Jose Trevino in the top of the second. Round Rock answered an inning later in the form of a Myles Straw RBI single that scored DH Drew Ferguson from second base. The E-Train captured their first lead in the sixth thanks to a Jack Mayfield single followed by a Yordan Alvarez RBI double. After Nashville leveled the game once more at 2-2 with a Willie Calhoun RBI double in the eighth, Alvarez struck again, launching a towering three-run home run to left-center that put the Express up 5-2. Prior to Alvarez' Pacific Coast League-leading fifth home run of the season, RF Derek Fisher and Mayfield tallied a pair of singles to set up the three-run shot. A dramatic 10th inning began with Sounds 1B Matt Davidson beginning at second base per MiLB's extra-innings rules. After a hit batter and an Ibanez single, McCurry found himself with the bases loaded and no outs. White then grounded to Tanielu at third, who fired home to record the force out at the plate. McCurry rebounded to retire the next to batters, keeping the score level at 5-5. Mayfield began the bottom of the 10th at second base before Del Pozo opted to intentionally walk Alvarez. LF Kyle Tucker then worked a full-count walk to load the bases for Tanielu. The infielder connected on a 1-0 offering from Del Pozo, launching a 441' walkoff grand slam that careened off the top of the Home Run Porch in deep left field. The hit was Tanielu's first career grand slam as well as his first career walkoff hit. (0-1, 3.38). First pitch at Dell Diamond is set for 7:05 p.m.